We've got some serious alphabet soup for you today! Decorative letters are hot on Pinterest (above image credit), and we were feeling inspired by all the different shapes, sizes and styles of how crafters like to get their word on. Using chipboard, paper mache, or even making your own letter base gives you an ideal palette to put your personal mark on your monogram moniker. We discovered some of the cutest and craftest how-to's to help you design your word art. Keep reading for the ultimate lowdown on how to make your own. A super simple way to add a pop of contrasting color? Sign off on this fabric covered version! We spied a few different takes on the yarn wrapped letter, but we love the modern look that 'dipping' the letters in yarn gives, don't you? Not only is jute an inexpensive material to purchase, it also gives just the right touch of rustic chic. Another one of our favorite ways to add texture? Burlap it up! Anaglya...what? Yup, that's what we said too. Anaglypta is a Victorian wallpaper that gives the look of decorative plaster. We think the use of it is a perfect way to dress up any letter! You can also use standard wallpaper to get things covered, too. These monograms make quite the entrance! Shine on, shine on. Mod Podge to the rescue once again in these super cool and on-trend zinc effect beauties. So you'll need a power tool for this one. But it's so worth it. We'll drink to this idea! Glue wine corks to a wooden letter base for some dimensional pop to your letter. Our vote goes to this nailhead trimmed version as the studliest of them all! Mod Podge Rocks Stencils take the stage to create an amazing textured effect on these monograms. Phew! We know there's a ton more ideas out there, but we hope you like some of our faves. What other types of finishes have you seen or done on monogram alphabet letters? #1 - Nursery or Kids Rooms: Spelling out your little one's name makes them feel special! #2 - Holiday Decor: Round up a few letters to spell out words like 'joy' for Christmas or 'boo' for Halloween decor. #3 - Letters as Home Decor: Collect your letter to create a gallery wall of your family's monogram! We love mixing up the scale and materials used to create an interesting contrast. #4 - Wedding Decor: Make your wedding decor personal by adding letters or your monogram to the mix! Let us know what ways you envision using your newly minted letter! 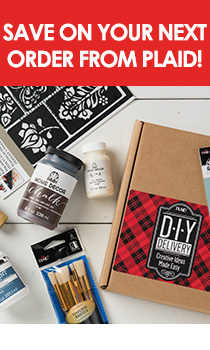 Find craft supplies to whip up your next monogram in the Plaid Store.